When Hitler's forces poured into France and the Low Countries in 1940, the uneasy peace of the 'Phoney War' was shattered, and Europe was ripped apart by another Blitzkrieg. Forming the backbone of the German advance were the well-equipped Schützen (Rifles), motorized infantry who embodied the essence of the fluid, swift warfare that had characterized World War II thus far. Facing them were infantrymen of the British Expeditionary Force, units of considerable fighting quality who had nevertheless received no special training to conduct combined-arms warfare in conjunction with armour. 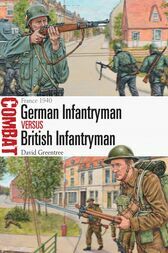 This study investigates the combat between the two adversaries at small-unit level, recreating the ferocity of the fighting on the front lines of the Battle of France in three key clashes at Arras, Calais and Merville. Assessing the training, organization and unit ethos of both sides in the context of a new type of mobile warfare, David Greentree reveals the extraordinary difficulties encountered by infantry units in trying to remain in contact with their armoured and mechanized formations.